Sarin’s Emad Dabiri has made the most of his move to Berlin, tapping all manner of new connections and producers for his always intriguing, murky, and heavy-hitting X-IMG label. Its latest release is a split cassette from Italy’s Unconscious and Germany’s HKKPTR, and nicely points out the distinctions to be found within the new wave of dark electronics emerging from Berlin’s club scene. 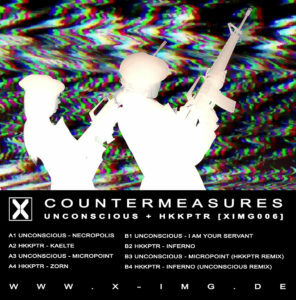 Unconscious’ tracks pay clear homage to classic Belgian EBM and new beat, offering plenty of bounce and melodic flourishes even as minimal basslines throb out over metronomic clicks. 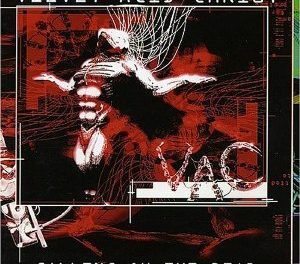 With even the odd hint of giallo and French electro tossed in, tunes like “Micropoint” and “I Am Your Servant” show just how many histories are coming together under the current techno/EBM rubric. HKKPTR’s tracks are fare more austere, cleaving to a cold and textured school of techno that prioritizes kicks which have obviously been keenly honed and designed but also have an immediate and ruthless simplicity. Minimal, metallic bass is strictly chained to those kicks and lends steely impassivity to “Kaelte” and “Zorn”. As disparate as the two producers might seem, the fact that the split finishes with them each remixing one of the other’s tunes is instructive: X-IMG’s a big tent operation for a small label, and things seem very copacetic on the dark club floor at the moment. 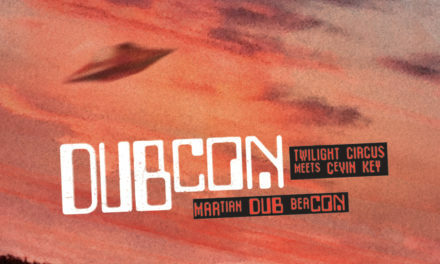 An imagined team-up between The Gothsicles’ Brian Graupner and Volt 9000’s Cory Gorski might take on a bleepy, video game inspired form, but strangely their actual collaborative debut as Crudmouth is a bizarre world take on grunge of all things. 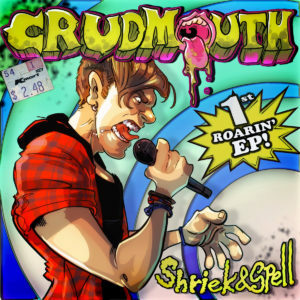 Unexpected as that might be, there’s plenty of weird fun in Shriek & Spell’s brief run-time, not the least of which is the funhouse interpretation of rock music from two left of center electronic musicians. Opener “Subtractive” sets the tone with a rolling bassline, flanged guitar and Graupner’s distinctive yelp, structurally a rock song (including a full on double time bridge) but rendered through synthesis. “Diseased Reasoning”’s raunchy riff and palm-muted chug summons to mind songs by L7 and Mudhoney, complete with the fuzzy production so common amongst the non mainstream 90s alt stalwarts. A reinterpretation of The Gothsicles “Sun Shy” might be the most instructive moment on the EP, as it preserves the song’s chorus but slows the tempo to a slow stomp, making no attempt to hide the artifacting from time stretching the vocals. That balance between trying to filter rock through Gorski and Graupner’s production sensibilities is really what makes up Crudmouth’s appeal beyond any of it’s immediate lo-fi charms.